Slash your business phone bill, super charge your team communication and create a better customer experience. We can help you. We know why 3CX Phone System is good for your business and how to tailor and customise the 3CX Phone System to cater your business needs. 3CX Phone Systems are a bit complex and you need experts to handle that complexity. We are 3CX Phone System experts. 3CX is one of the best phone system solutions worldwide. Your business and team is growing? Or you are expanding and opening up in new locations? You need to upgrade your company’s outdated phone system? You want CRM integration to make the things faster or need to add more features? Your call volume has outpaced the capability of your current phone system? You are paying too much for technicians on-site visits? Never miss a call. Remain reachable on the go, or across multiple sites. 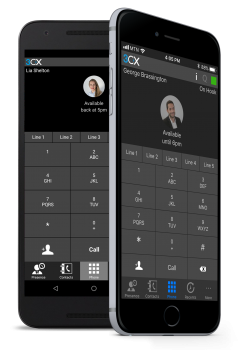 3CX Phone System can be operated from Windows or Mac desktop, or directly from your iPhone or Android. 3CX Phone System saves time and hence turbo-charges your team productivity and efficiency. Why should you choose 3CX Phone System? 3CX is a cloud-based VOIP phone system. It includes unlimited calls. It saves on calls & on-premise server costs. It can be remotely managed, so can save on technicians on-site visits. 3CX Phone System can be implemented on existing hardware. No need to replace existing. Easy and faster communication between all employees of the business. Faster & Personal Communication with customers. Ensures that important calls are given the attention they deserve. Additional handsets can be added anytime. It’s a future proof communication system. Better communication boosting employee productivity and customer service. Power Your Business with 3CX Phone System Features. So colleagues know your availability. Popular CRMs: Click2call/Outlook/Salesforce. Launch calls directly from your favourite CRM. Get in touch with one of our 3CX Phone System experts to discuss your requirements. © 2018 MeshTelco. All Rights Reserved.